Harare — At least five people have been killed as police opened live ammunition to quell protests in the restive Zimbabwe following protests over a steep price increase. The deaths injury of no less than 24 others in the wake of the demonstrations triggered by the worsening economic crises are an indictment of the repressive state apparatus months after government forces shot dead six civilians during post-election protests. The Zimbabwe Association of Doctors for Human Rights (ZADHR), which confirmed the deaths, said it had treated more than 20 victims following the demonstrations that swept across the impoverished country days after President Emmerson Mnangwaga announced a more than 150 percent increase in the price of petrol and diesel to over US$3 (R42) per litre. The Zimbabwe Congress of Trade Unions (ZCTU) called for a three-day general strike starting on Monday, which culminated in clashes between police and angry civilians. State Security Minister, Owen Ncube, said over 200 individuals suspected of involvement in violent protests had been arrested. "The security services tracking down others and sifting through video and photographic evidence to identify more. Normalcy is assured and the public is urged to do their normal activities," a government spokesperson said. At midnight, the headquarters of the opposition Movement for Democratic Change (MDC) Alliance in Harare was petrol-bombed by unknown people the party suspects are from the ruling Zimbabwe African National Union-Patriotic Front (ZANU-PF). On Tuesday, local cities resembled ghost towns as people largely stayed indoors. "Today (Tuesday) is day two of the shutdown. Our struggle is genuine and there must be economic reforms for the poor to survive," the labour union stated. Schools nationwide were closed. Public transport stopped operating. "The masses have spoken," said lawyer and activist, Doug Coltart. Meanwhile, internet services were shut down in an apparent ploy by government to stifle protests. 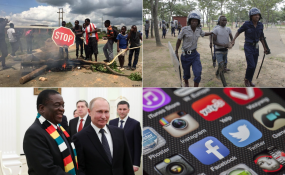 Services such as WhatsApp and Facebook were blocked, reminiscent of scenes in 2006 when the government of then-president, Robert Mugabe, faced countrywide protests. The opposition said the internet blockade was aimed at covering up a crackdown against civilians by the heavy-handed security services. Zimbabwe is the fourth country after Democratic Republic of Congo, Gabon and Sudan to shut internet services amid anti-government sentiment this year. The Southern African country battling severe economic hardships that the Mnangagwa's government had pledge to address when he was elected in contentious polls held last July.